Upgrading from CoreStore 5.x (min iOS 9) to 6.x (min iOS 10)? Check out the new features and make sure to read the Change logs. CoreStore is now part of the Swift Source Compatibility projects. CoreStore was (and is) heavily shaped by real-world needs of developing data-dependent apps. It enforces safe and convenient Core Data usage while letting you take advantage of the industry's encouraged best practices. 💎Tight design around Swift’s code elegance and type safety. CoreStore fully utilizes Swift's community-driven language features. 🎯Free to name entities and their class names independently. CoreStore gets around a restriction with other Core Data wrappers where the entity name should be the same as the NSManagedObject subclass name. CoreStore loads entity-to-class mappings from the managed object model file, so you can assign different names for the entities and their class names. 📙Full Documentation. No magic here; all public classes, functions, properties, etc. have detailed Apple Docs. This README also introduces a lot of concepts and explains a lot of CoreStore's behavior. 🛡More extensive Unit Tests. Extending CoreStore is safe without having to worry about breaking old behavior. Have ideas that may benefit other Core Data users? Feature Requests are welcome! But really, there's a reason I wrote this huge README. Read up on the details! Check out the CoreStoreDemo app project for sample codes as well! For maximum safety and performance, CoreStore will enforce coding patterns and practices it was designed for. (Don't worry, it's not as scary as it sounds.) But it is advisable to understand the "magic" of CoreStore before you use it in your apps. This allows for a butter-smooth main thread, while still taking advantage of safe nested contexts. Adds an SQLiteStore in the "Application Support/" directory (or the "Caches/" directory on tvOS) with the file name "[App bundle name].sqlite"
💡By default, CoreStore will initialize NSManagedObjects from .xcdatamodeld files, but you can create models completely from source code using CoreStoreObjects and CoreStoreSchema. To use this feature, refer to Type-safe CoreStoreObjects. 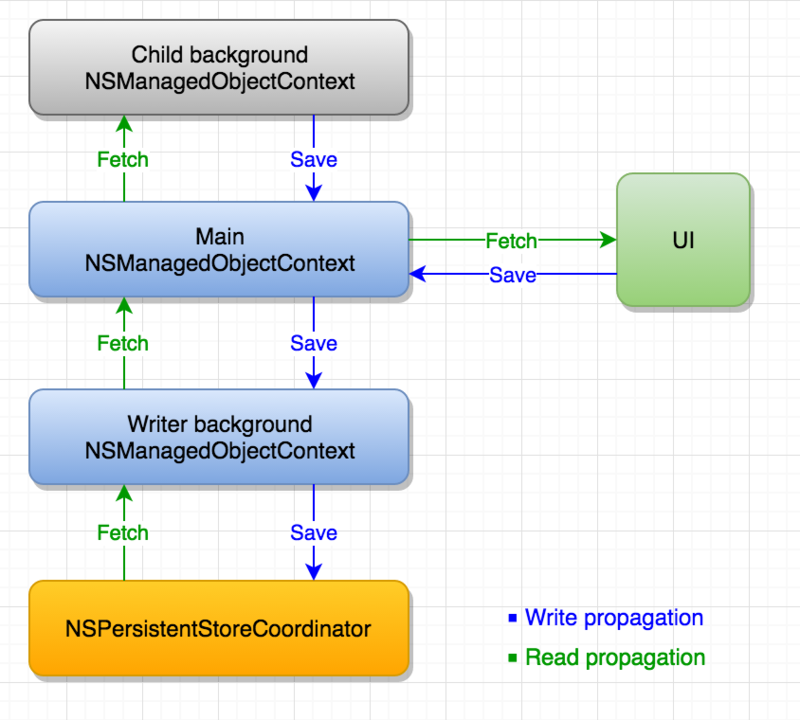 Notice that in our previous examples, addStorageAndWait(_:) and addStorage(_:completion:) both accept either InMemoryStore, SQLiteStore, or ICloudStore. These implement the StorageInterface protocol. The most basic StorageInterface concrete type is the InMemoryStore, which just stores objects in memory. Since InMemoryStores always start with a fresh empty data, they do not need any migration information. The most common StorageInterface you will probably use is the SQLiteStore, which saves data in a local SQLite file. Refer to the SQLiteStore.swift source documentation for detailed explanations for each of the default values. func dictionary(forOptions: LocalStorageOptions) -> [String: AnyObject]? If you have custom NSIncrementalStore or NSAtomicStore subclasses, you can implement this protocol and use it similarly to SQLiteStore. XcodeDataModelSchema: a model version with entities loaded from a .xcdatamodeld file. UnsafeDataModelSchema: a model version created with an existing NSManagedObjectModel instance. if you do so, any model mismatch will be thrown as an error. The completion block reports a SetupResult that indicates success or failure. self?.percentLabel?.text = progress.localizedDescription // "50% completed"
self?.stepLabel?.text = progress.localizedAdditionalDescription // "0 of 2"
This closure is executed on the main thread so UIKit and AppKit calls can be done safely. By default, CoreStore uses Core Data's default automatic migration mechanism. In other words, CoreStore will try to migrate the existing persistent store until it matches the SchemaHistory's currentModelVersion. If no mapping model path is found from the store's version to the data model's version, CoreStore gives up and reports an error. The most common usage is to pass in the model version (.xcdatamodeld version names for NSManagedObjects, or the modelName for CoreStoreSchemas) in increasing order as above. ⚠️Important: If a MigrationChain is specified, the .xcdatamodeld's "Current Version" will be bypassed and the MigrationChain's leafmost version will be the DataStack's base model version. Each MigrationType indicates the migration type for each step in the MigrationChain. Use these information as fit for your app. InferredSchemaMappingProvider: The default mapping provider which tries to infer model migration between two DynamicSchema versions either by searching all .xcmappingmodel files from Bundle.allBundles, or by relying on lightweight migration if possible. XcodeSchemaMappingProvider: A mapping provider which loads entity mappings from .xcmappingmodel files in a specified Bundle. CustomSchemaMappingProvider: A mapping provider that infers mapping initially, but also accepts custom mappings for specified entities. This was added to support custom migrations with CoreStoreObjects as well, but may also be used with NSManagedObjects. For version migrations present in the DataStack's MigrationChain but not handled by any of the SQLiteStore's migrationMappingProviders array, CoreStore will automatically try to use InferredSchemaMappingProvider as fallback. Finally if the InferredSchemaMappingProvider could not resolve any mapping, the migration will fail and the DataStack.addStorage(...) method will report the failure. The UnsafeSourceObject is a read-only proxy for an object existing in the source model version. The UnsafeDestinationObject is a read-write object that is inserted (optionally) to the destination model version. Both classes' properties are accessed through key-value-coding. ⚠️Important: Never use try? or try! on a transaction.cancel() call. Always use try. Using try? will swallow the cancellation and the transaction will proceed to save as normal. Using try! will crash the app as transaction.cancel() will always throw an error. The examples above use perform(asynchronous:...), but there are actually 3 types of transactions at your disposal: asynchronous, synchronous, and unsafe. ⚠️Be careful when returning NSManagedObjects or CoreStoreObjects from the transaction closure. Those instances are for the transaction's use only. See Passing objects safely. Transactions created from perform(asynchronous:...) are instances of AsynchronousDataTransaction. transaction above is a SynchronousDataTransaction instance. Since perform(synchronous:...) technically blocks two queues (the caller's queue and the transaction's background queue), it is considered less safe as it's more prone to deadlock. Take special care that the closure does not block on any other external queues. // newPerson may be nil! // The DataStack may have not yet received the update notification. Due to this complicated nature of synchronous transactions, if your app has very heavy transaction throughput it is highly recommended to use asynchronous transactions instead. This allows for non-contiguous updates. Do note that this flexibility comes with a price: you are now responsible for managing concurrency for the transaction. As uncle Ben said, "with great power comes great race conditions." As the above example also shows, with unsafe transactions commit() can be called multiple times. You've seen how to create transactions, but we have yet to see how to make creates, updates, and deletes. The 3 types of transactions above are all subclasses of BaseDataTransaction, which implements the methods shown below. If the entity does not belong to any store, an assertion failure will be raised. This is a programmer error and should never occur in production code. If the entity belongs to multiple stores, an assertion failure will be raised. This is also a programmer error and should never occur in production code. Normally, with Core Data you can insert an object in this state but saving the NSManagedObjectContext will always fail. CoreStore checks this for you at creation time when it makes sense (not during save). Note that if you do explicitly specify the configuration name, CoreStore will only try to insert the created object to that particular store and will fail if that store is not found; it will not fall back to any other configuration that the entity belongs to. ImportableObject: Use this protocol if the object have no inherent uniqueness and new objects should always be added when calling importObject(...). ImportableUniqueObject: Use this protocol to specify a unique ID for an object that will be used to distinguish whether a new object should be created or if an existing object should be updated when calling importUniqueObject(...). You can even use external types from popular 3rd-party JSON libraries, or just simple tuples or primitives. Doing so tells the transaction to iterate through the array of import sources and calls shouldInsert(from:in:) on the ImportableObject to determine which instances should be created. You can do validations and return false from shouldInsert(from:in:) if you want to skip importing from a source and continue on with the other sources in the array. static func uniqueID(from source: ImportSource, in transaction: BaseDataTransaction) throws -> UniqueIDType? For ImportableUniqueObject, the extraction and assignment of values should be implemented from the update(from:in:) method. The didInsert(from:in:) by default calls update(from:in:), but you can separate the implementation for inserts and updates if needed. As with ImportableObject, you can control wether to skip importing an object by implementing shouldInsert(from:in:) and shouldUpdate(from:in:), or to cancel all objects by throwing an error from the uniqueID(from:in:), didInsert(from:in:) or update(from:in:) methods. people in the example above will be of type [MyPersonEntity]. The From<MyPersonEntity>() clause indicates a fetch to all persistent stores that MyPersonEntity belong to. Now we know how to use a From clause, let's move on to fetching and querying. There are currently 5 fetch methods you can call from CoreStore, from a DataStack instance, or from a BaseDataTransaction instance. All of the methods below accept the same parameters: a required From clause, and an optional series of Where, OrderBy, and/or Tweak clauses. fetchAll(...) - returns an array of all objects that match the criteria. fetchOne(...) - returns the first object that match the criteria. fetchCount(...) - returns the number of objects that match the criteria. fetchObjectIDs(...) - returns an array of NSManagedObjectIDs for all objects that match the criteria. fetchObjectID(...) - returns the NSManagedObjectIDs for the first objects that match the criteria. Each method's purpose is straightforward, but we need to understand how to set the clauses for the fetch. .where(\.age > 30) // Type-safe! If you do not provide a Where clause, all objects that belong to the specified From will be returned. The OrderBy clause is CoreStore's NSSortDescriptor wrapper. Use it to specify attribute keys in which to sort the fetch (or query) results with. The clauses are evaluated the order they appear in the fetch/query, so you typically need to set Tweak as the last clause. Tweak's closure is executed only just before the fetch occurs, so make sure that any values captured by the closure is not prone to race conditions. While Tweak lets you micro-configure the NSFetchRequest, note that CoreStore already preconfigured that NSFetchRequest to suitable defaults. Only use Tweak when you know what you are doing! queryValue(...) - returns a single raw value for an attribute or for an aggregate value. If there are multiple results, queryValue(...) only returns the first item. queryAttributes(...) - returns an array of dictionaries containing attribute keys with their corresponding values. Both methods above accept the same parameters: a required From clause, a required Select<T> clause, and an optional series of Where, OrderBy, GroupBy, and/or Tweak clauses. Setting up the From, Where, OrderBy, and Tweak clauses is similar to how you would when fetching. For querying, you also need to know how to use the Select<T> and GroupBy clauses. The example above queries the "age" property for the first object that matches the Where condition. johnsAge will be bound to type Int?, as indicated by the Select<Int> generic type. For queryValue(...), types that conform to QueryableAttributeType are allowed as the return type (and therefore as the generic type for Select<T>). The GroupBy clause lets you group results by a specified attribute/aggregate. This is useful only for queryAttributes(...) since queryValue(...) just returns the first value. One unfortunate thing when using some third-party libraries is that they usually pollute the console with their own logging mechanisms. CoreStore provides its own default logging class, but you can plug-in your own favorite logger by implementing the CoreStoreLogger protocol. Doing so channels all logging calls to your logger. Note that to keep the call stack information intact, all calls to these methods are NOT thread-managed. Therefore you have to make sure that your logger is thread-safe or you may otherwise have to dispatch your logging implementation to a serial queue. Starting CoreStore 2.0, all CoreStore types now have very useful (and pretty formatted!) print(...) outputs. These are all implemented with CustomDebugStringConvertible.debugDescription, so they work with lldb's po command as well. To get notifications for single property changes in an object, there are two methods depending on the object's base class. For both methods, you will need to keep a reference to the returned observer for the duration of the observation. The controller will then notify our observer whenever the object's attributes change. You can add multiple ObjectObservers to a single ObjectMonitor without any problem. This means you can just share around the ObjectMonitor instance to different screens without problem. You can get ObjectMonitor's object through its object property. If the object is deleted, the object property will become nil to prevent further access. While ObjectMonitor exposes removeObserver(...) as well, it only stores weak references of the observers and will safely unregister deallocated observers. listMonitorDidChange(_:) and listMonitorDidRefetch(_:) implementations are both required. listMonitorDidChange(_:) is called whenever the ListMonitor's count, order, or filtered objects change. listMonitorDidRefetch(_:) is called when the ListMonitor.refetch() was executed or if the internal persistent store was changed. Similar to ObjectMonitor, a ListMonitor can also have multiple ListObservers registered to a single ListMonitor. If you have noticed, the monitorList(...) method accepts Where, OrderBy, and Tweak clauses exactly like a fetch. As the list maintained by ListMonitor needs to have a deterministic order, at least the From and OrderBy clauses are required. ⚠️Objective-C support is planned to be deprecated in a future CoreStore version. All of these CS-prefixed bridging classes have very similar usage to the existing CoreStore APIs, and ironically none of them are written in Objective-C. This is very different to the common approach where apps and libraries write Objective-C APIs just to support both Objective-C and Swift. The advantage with CoreStore's approach is that your Swift codebase can already use the purely-Swift API without further changes in the future, but your "hybrid" codebase can still bridge instances back and forth from Objective-C to Swift. Note that the CSListMonitor holds the exact same ListMonitor instance, which means that no copies and no extra fetching occur. To use these syntax sugars, include CoreStoreBridge.h in your Objective-C source files. Starting CoreStore 4.0, we can now create persisted objects without depending on .xcdatamodeld Core Data files. The new CoreStoreObject subclass replaces NSManagedObject, and specially-typed properties declared on these classes will be synthesized as Core Data attributes. 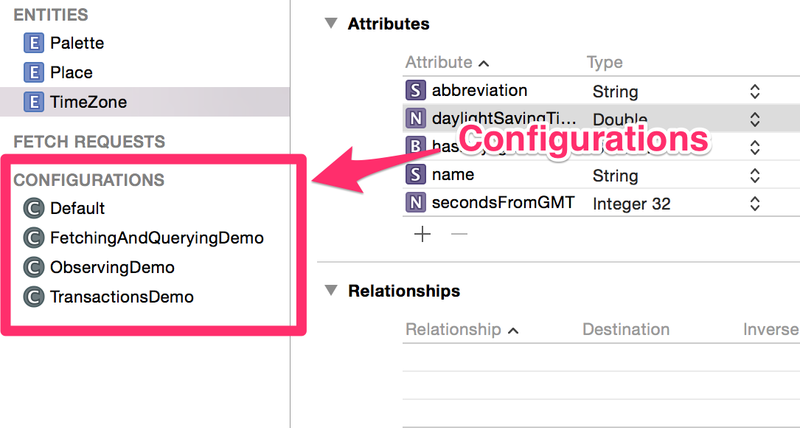 Here we added an underscore to the property name and made it private, but the underlying key-path "name" was unchanged so our model will not trigger a data migration. ⚠️Important: As a rule, CoreStore can only process stored properties. Computed, static, weak, or lazy properties will be ignored and will not be added to the store. It is also strictly advised use let instead of var to declare these properties, as any changes to the property value will break the schema. Also note how Relationships are linked statically with the inverse: argument. All relationships are required to have an "inverse" relationship. Unfortunately, due to Swift compiler limitation we can only declare the inverse: on one end of the relationship-pair. And that's all CoreStore needs to build the model; we don't need .xcdatamodeld files anymore. let dog: Dog = transaction.fetchOne(From<Dog>())! let nickname = dog.nickname.value // String? All CoreStore APIs that are usable with NSManagedObjects are also available for CoreStoreObjects. 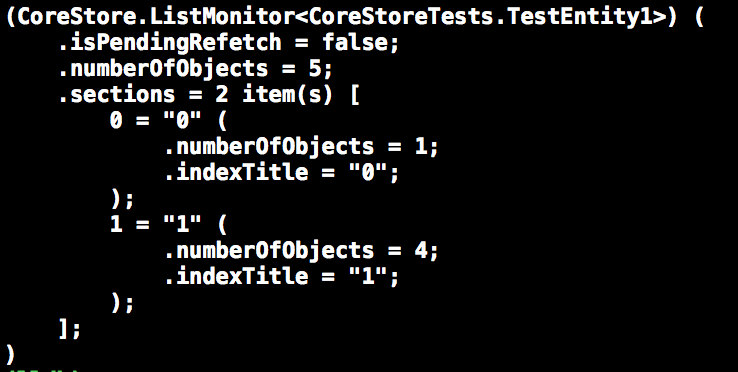 These include ListMonitors, ImportableObjects, fetching, etc. While it is convenient to be able to declare entities only in code, it is worrying that we might accidentally change the CoreStoreObject's properties and break our users' model version history. For this, the CoreStoreSchema allows us to "lock" our properties to a particular configuration. Any changes to that VersionLock will raise an assertion failure during the CoreStoreSchema initialization, so you can then look for the commit which changed the VersionLock hash. The com.apple.CoreData.ConcurrencyDebug debug argument should be turned off for the app. CoreStore already guarantees safety for you by making the main context read-only, and by only executing transactions serially. This installs CoreStore as a framework. Declare import CoreStore in your swift file to use the library. Declare import CoreStore in your swift file to use the library. Drag and drop CoreStore.xcodeproj to your project. To use the Objective-C syntax sugars, import CoreStoreBridge.h in your .m source files. For the full Changelog, refer to the Releases page. I'd love to hear about apps using CoreStore. Send me a message and I'll welcome any feedback!